Day 1. Arrival in Istanbul and transfer to the Topkapi Palace. (On Tuesdays Topkapi is closed so we will replace it then with St. Sophia and Mosque of Soliman) Topkapi Palace was used by the Ottoman Sultans from the 15th to 19th centuries. In Topkapi you will also see a fabulous collection of priceless jewels, crystal, silver and porcelain, costumes worn by the sultans and relics of the prophet Mohammed. (Entrance to the Harem is with extra fee.) After the visit of Topkapi we will proceed to an old hidden underground Byzantine cistern. Our next visit will be to the famous Grand Bazaar. This tour may be done wholly or partially as a walking tour. Staying overnight in Istanbul. Dolmabahce, Ciragan and Beylerbeyi and you will enjoy crossing from continent to continent travelling along Bosphorus, lined with old Ottoman seaside mansions, fortresses and small fishing villages. 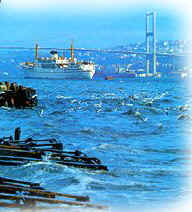 We will disembark at Sariyer close by the Black Sea and drive to Gallipoli. Our way will take us to Silivri through nice motorways and after Silivri we will be driving on a superhighway to Gallipoli. We will have a total drive of 260 km. today. We will check in to a sea side small hotel by the Saros bay located at the very northern part of the Aegean Sea. Overnight in Canakkale. Day 3. We will depart early today to pass across the Strait of Dardanelles by ferry. The crossing will take about half an hour and when we reach the other side of the Strait we will already be in Asia. 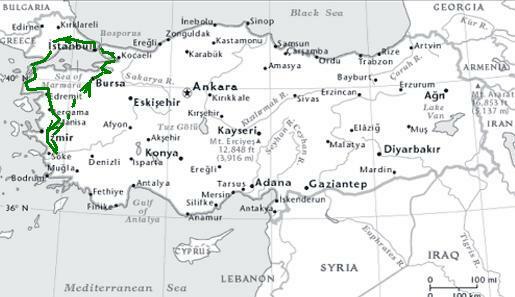 We will then by pass the town of Canakkale and reach Troy. The legendary city of Homer and the beautiful Helen has nine principal levels of occupation covering a period of 3000 years. You will see a reproduction of the Trojan horse, the museum, city walls dating from the time of Trojan war, Schliemann’s trench and more. 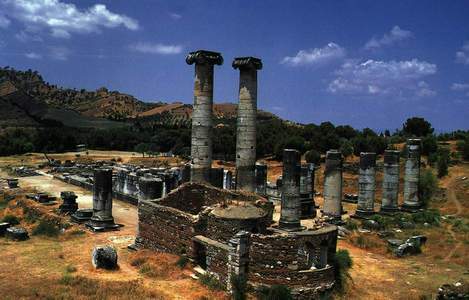 After a visit lasting about 1.5 hours we will proceed towards Bergama and reach the Acropolis of the ancient Pergamon after a scenic drive of 199 km. We will have an in depth guided promenade here in this magnificent Acropolis situated high above a plain with a unique panoramic view. We will visit the palaces of Pergamon kings, the remains of the Great Library where more than 200000 volumes and manuscripts made of papyrus and parchment paper (pergamena) which was first produced in Pergamon. We will see the Temple of Trajan, the Athena temple and the very steep theatre on the hillside which could seat up to 10,000 people. The flight of steps takes you 4.5 metres high where the stylish Dionysus temple is situated. After that you will visit the ruins of Zeus Altar which was one of the seven wonders of the world in the Hellenistic period. After our stop at Acropolis we will descend down to Asclepion, which was known as one of the first places of medical science in the ancient world together with Epidauros in Greece. Galen who was born in Pergamon in 129 AD became a famous physician of his time and treated his patients here. Here I will tell you how the doctors treated their patients in natural ways. After we finish our visit here we will proceed to Akhisar (ancient Thyatira). The driving distance is only 122 km and we can cover this in about 1.5 hours. Staying overnight in Akhisar. 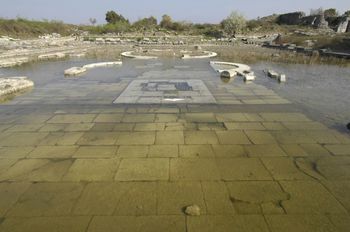 the Delphinion, a temple dedicated for the cult of Dolphins. The people of a town like Miletus surrounded by seas from every corner certainly knew how intelligent and sensitive Dolphins were. Dolphins must have helped sailors in their difficult times showing them the best direction when their ships were pushed into shallow seas with heavy storms. 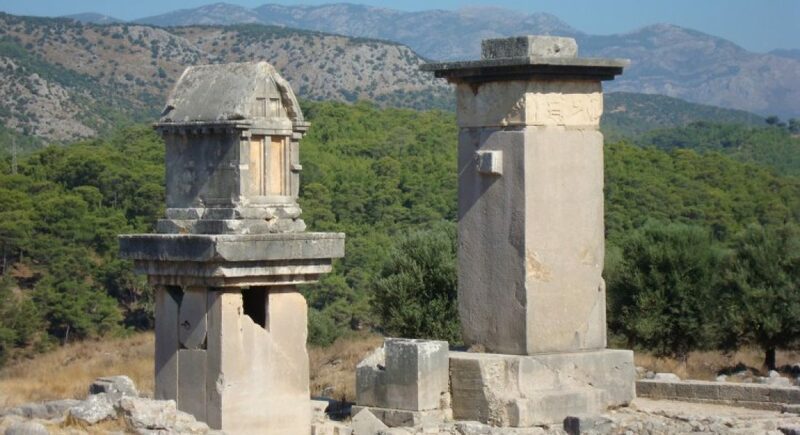 We will also see the beginning of the sacred way where annual pilgrims procession were started from the Delphinions towards the Apollo temple of Didyma 20 km further down in the South. We will then see a Nymphaion (where water fairies Nymphes used walk around the abundant waters of these colossal size fountains), a bouleuterion (the senate building), Serapis temple (a temple dedicated to the underground Goddess of Serapis of Egypt) built for the worship needs of the Egyptian traders and travellers, food depots and Faustina Baths built in the second century AD for Faustina, the wife of Emperor Marcus Aurelius. On our way back after 5 km we will see a hill which was an Island in those times before the Meander river silted the sea in that region and created the fertile plain. The two harbours of this island which is now a hill, were housing the famous Ionian fleet designed to fight the Persian fleet but a sudden Persian attack in 494 BC set it on fire and destroyed the Ionian fleet before Ionian ships had even time to move out of the harbour. Staying overnight in Ephesus. Day 5. This morning we will drive to Ephesus. We will see several monuments in this ancient metropolis. Among many others I will mention the Domitian Temple, the Celcius Library, the Northern Agora, the Theatre, The Old Harbour Boulevard. After that we will visit the Museum located in the nearby town of Selcuk and proceed towards Bursa. We will get to Bursa in the evening and will stay overnight here. Karagoz and Hacivat, two workers in the mosque’s construction. With their puns, the pranksters distracted fellow workers so much that construction was delayed. 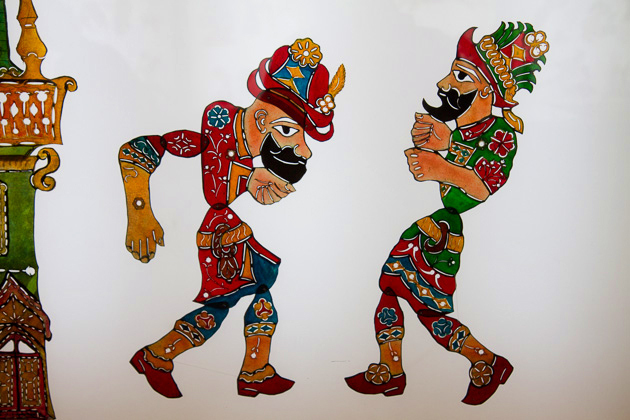 The angry Sultan Orhan had them beheaded, but soon repented and devised the art that survives today – camel-leather painted figures in a shadow-theatre also known as Karagoz, famous in Turkey. After this we will visit the mausoleums of the first two sultans of the Ottoman Empire. Osman Bey and his son Orhan Gazi. We will then visit an old Caravan hotel where there are several silk shops. After this we will also visit the grand covered bazaar of Bursa and see a man I know who is puppeteer of Hacivat and Karagoz. He might perform a Hacivat Karagoz shadow-theatre performance for 10 Euros for our guests. Next stop will be at Yesil Cami and Yesil Turbe which houses the tomb of the 5th Sultan of the Ottoman dynasty. There are beautiful green and blue tiles in both monuments. In the afternoon we will start driving towards Istanbul and on our way we won’t miss the opportunity to visit Iznik, the ancient Nicea. Nicea was an important town of the Eastern Roman Empire and the art of tile making had reached a peak during the 16th century. It is also the town where the first Council of Nicea was held at the time of the Roman Emperor Constantine I. We will see the Senate’s Court by the lake, the impressive St. Sophia church in the very centre of the small town by Constantine. Our way will take us through the Istanbul gate where we will make a short photo stop and proceed towards Istanbul. From Topcular we will take a ferry and get to Eskihisar in about half an hour. From Eskihisar we will drive to the possible place where Hannibal was buried. Hannibal who was a Carthagenian commander and an enemy of Romans was escaping his enemies and found refuge in Bithynia. But when he understood the King of Bithynia Prusias would be delivering him to his enemies he committed suicide and was buried here. After this visit we will take the motorway to drive back to the hotel. Staying overnight in Istanbul. Day 7. Today according to the estimated take off time of our aircraft we will make a tour in the Golden Horn before we depart to the airport. 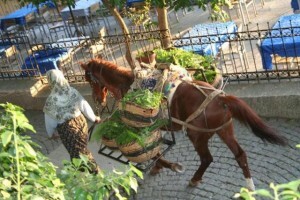 First we will visit the Mosque of Eyup and its complex, then climb up to Cafe of Pierre Loti through the old cemetery. As we will sip our coffees with an unparalleled view over the Golden Horn we will talk about his novel Aziyade and the adventures he lived during the last times of the Ottoman Empire. After this visit we will proceed to Kariye Museum which is an ancient church transformed into a Mosque in the 15th century. Stories from Bible and the Old Testament are perfectly described on the walls of this ancient church with either frescoes or mosaics. Here we will understand why French people still use the expression “C’est Byzance” when they go to a nice place with a beautiful ambiance. The Kariye Museum is closed on Wednesdays and if today is a Wednesday we will have to move this visit to the second day before we depart to Gallipoli. After this visit we will be driving by the city walls of the ancient Constantinapolis between the Golden Horn and the Marmara Sea for several kilometres and continue to the Ataturk International Airport before we say a sad goodbye to each other.